What Makes Hyundai SUVs so Special? SUVs are becoming more and more popular with the American driving public. If you are considering the purchase of a new vehicle at South County Hyundai of Gilroy, you may want to consider an SUV. There are several good reasons why an SUV might be right for you. SUVs have a lot more interior room inside than your standard sedan. 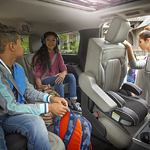 If you have a large family, or if you have a lot of gear and cargo that you want to transport, an SUV will provide more space and more comfort. You might want to consider an SUV for the safety factor as well. SUVs are big and sturdy vehicles. If you are in an accident, you will be safer in an SUV than if you are driving a small compact car. Many SUVs also come with four-wheel drive, and this feature can help you stay safer when you are travelling on slick roads.